Wine and bread is the most basic and oldest pairing known to mankind dating back to times immemorial, even finding a mention in the bible. It is also the most “natural” and balanced pairing as the process of fermentation is used for making both dough and wine. Try using bread as more than just a side dish and drink that Champagne with Brioche, Sangiovese with Olive bread, Rosé with Focaccia, Pinot Noir with Rye bread, and Cabernet Sauvignon with French bread or a Riesling with any sweet bread. You can easily make a meal out it. While bread has somewhat of a neutral profile, it gets a little tricky when it comes to pairing wine with Indian flatbread or roti. And who would think of pairing different kinds of speciality Indian breads like Paratha, Kulcha & Bakarkhani with, lo and behold, French Wine? Well there is a place right here in the heart of our capital where you can find this innovative concept being executed with aplomb. Naanery at Baluchi, the signature Pan Indian restaurant at The Lalit, Barakhmaba Road, New Delhi, already well known for its unprecedented bread bar menu, has come out with an offer where French wines are paired with breads baked right in front of you in an iron tandoor. These breads are different from what is served at most Indian restaurants. They come in bite size portions and have been chosen by Executive Chef Ajay Kumar, from various regions of India. The concept of Naanery or Roti Bar is the first in India where the humble “roti” has been elevated to the status of a star. The wines have been chosen by French sommelier Charles Donnadieu (MC Sommellerie 2005/06 Lycée Professionnel Etincelle) who comes from a small town called Bagard in south of France. He joined as Corporate Sommelier of the Lalit Group in May 2014, a position specially created for him by Keshav Suri, Executive Director of Lalit Group of Hotels for the purpose of developing a wine culture in his hotels. Charles is instrumental in planning this menu and handpicking the most suitable French wines to match the flavour profile of the different Indian breads. First pairing offered is Pheni Paratha, a flaky bread originating from Meerut made with generous amounts of ghee (clarified butter), sesame seed & pistachios paired with an off dry fruity & floral white wine, Vaucluse Domaine La Pigeade “Petits Grains de Folie” 2014. The acidity of the crisp wine cuts through the butter in the bread and the lychee flavor lifts up the slight sweetness of the Pheni Paratha very well. The wine is made from 100% “Muscat blanc`a Petits Grains” which ampelographic evidence shows is one of the oldest cepage (grape variety) still in existence. Next comes Gilafi Kulcha from Lucknow, a double layered bread with cheese, vegetable & coriander leaves paired with a medium bodied red AOC Ventoux Domaine La Pigeade “Les Sables” 2014. The wine is a blend of Grenache, Carignan & Syrah and its red berry and pepper notes match the slightly spicy kulcha perfectly. Last pairing is of Bakarkhani, a semi-sweet specialty bread from Kashmir with AOC “Muscat de Beaumes de Venises” Domaine La Pigeade 2013, a unique and slightly potent “vin doux naturel”(sweet fortified wine) made with “mutage method” (addition of 96% proof grape spirit). This combination is a perfect marriage of grain and grape. 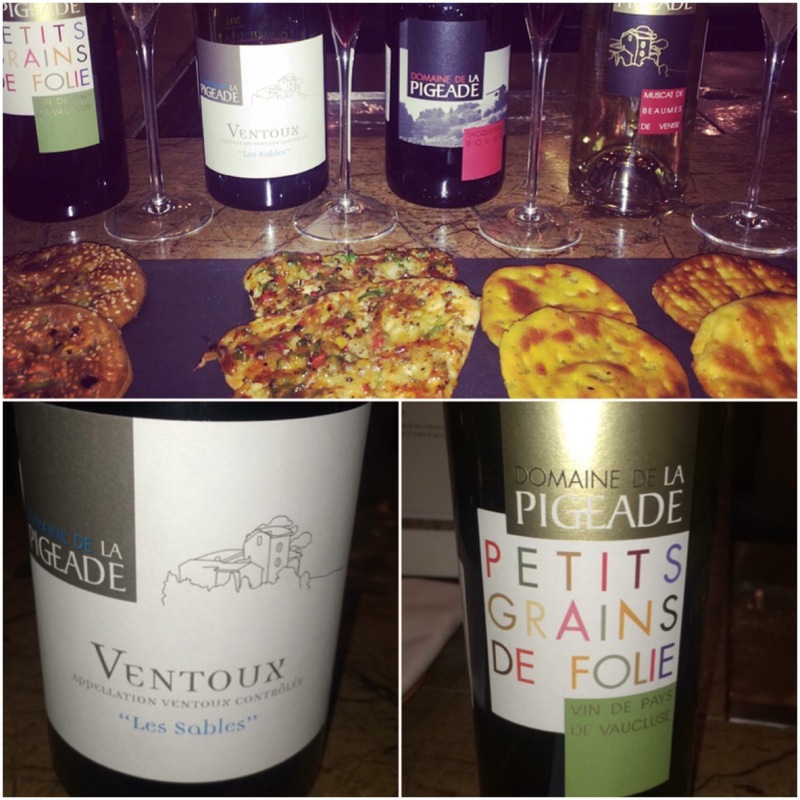 Domaine de La Pigeade are independent producers located at the foot of Mt. Ventoux in Southern Rhone Valley, who make 10 wines in four different appellations like Côtes du Rhone, Ventoux, Vacqueyras and Beaumes de Venise. It is a good opportunity to try out these offerings from South of France paired with breads from different parts of India. In case you wish to try out any other wines outside the menu, just ask the sommelier and he will take you to the well-stocked Wine Room located right across the Bread Bar. So go ahead and try out this new culinary experience which The Lalit wishes to share with you. Three glasses of French wine (50ml per glass) paired with three different types of Indian bread (2 pieces each) comes at a price of Rs 1000 pp + taxes.